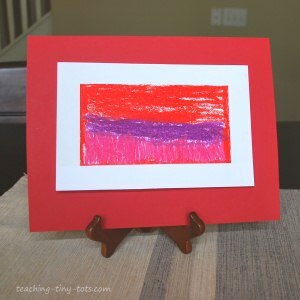 Cray-Pas (Jumbo Stick Oil Pastels) for toddler activities are a great medium to work with. Cray Pas are easy to apply to paper and have bright vivid colors. 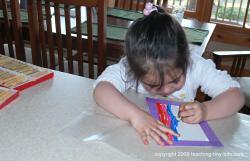 Allow your child to draw freely and see what beautiful colors they put together. Paper towels to wipe fingers on. Cut white paper to size desired. Place a strip of tape evenly along the edge of each side. Turn over and fold down the edges. 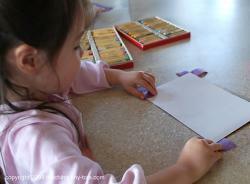 Let your child draw or color on paper and encourage coloring up to the tape to make a nice border when tape is removed. Remove tape when finished and mount onto colored cardstock. Cray-Pas was first developed in 1925. It took three years to develop the cray-pas that we know today. The name Cray-Pas is derived from the smooth application of crayons with the brightness of pastels.